Copper – not just for plumbing. From Franke boiling taps, Grohe taps in bathrooms to handles by Crofts & Assinder and Furnipart, many options are now going to be available in a copper finish. From polished copper, brushed more Matt finished to a distress looking classic finish. There are many variations available to try and blend it to suit your particular style. We are slowly building up a great sample collection of all these different finishes. The 1810 Sink Company have very recently unveiled new copper wastes for their sinks to tie in with the tap options that are on offer. This will be fitted onto our Silestone Integrity Duo Large sink on our Kitchen Stori Florence Graphite and Mussell display. We planned for this to tie together with the Crofts & Assinder Malvern polished copper handles. 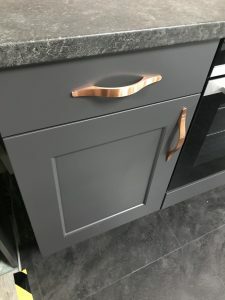 Further to this, Silestone Pulsar, which fits with the current trend of light white tops that are similar to Carrara Marble, but a hint of warmth with the aim of blending the mussell, copper, oak and graphite elements of the display. 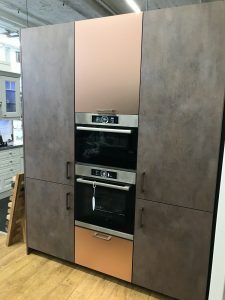 Rotpunkt, our high quality luxury German kitchen manufacturer have embraced this fashion trend with a group 3 Jewel Range door and Corten KQ range (both on diplay in our stockport showroom). We have brushed antique copper effect handles fitted to compliment this display. When opening the doors of this display, you will be treated to a truffle coloured interior, which I believe best suits these colour tones. It may be described as a ‘marmite’ type display. I do receive mixed reviews, but more often than not there is a like for it. Please feel free to visit our Stockport based Showroom; we may be found sharing space with the Pear Mill Vintage Emporium, whom also have an on-site café. We have many products already available to suit this trend. Richard & Richard’s is excited to using them in the future.